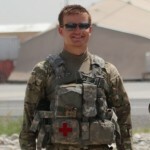 Chris is from upstate New York and commissioned as an Army officer from Cornell University. He spent eight years flying the Kiowa Warrior armed reconnaissance helicopter with two deployments to Afghanistan, most recently as the head of his squadron’s intelligence department. He is currently pursuing his MBA at NYU’s Stern School of Business.